The CM-5 bench-top spectrophotometer is an easy-to-use, color measurement instrument that features a keyboard and color LCD screen, eliminating the need for a computer. This product has the ability to automatically calibrate every start-up, measure a variety of sample sizes and forms, and includes internal calibration for standard chemical and pharmaceutical indices. 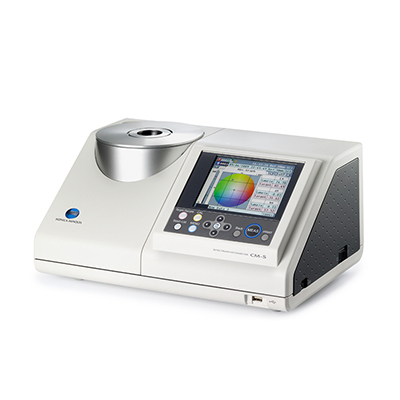 The CM-5 Spectrophotometer, a stand-alone, top-port color measuring instrument, is bench-top spectrophotometer with a large LCD screen and onboard software which eliminates the need for a separate computer. Color plots, as well as graphical and numerical data are displayed on the screen. The Operation Wizard, included with the unit, guides the user through the measurement process. Select Automatic Calibration to perform calibration every time the unit is turned on. Not only can the unit measure both transmittance and reflectance, but the user can can designate PASS/FAIL tolerances for each measurement as well. It’s no problem to measure samples in many forms such as pellets, solids, gelatins, powders, and pastes with the CM-5 and it’s accessories, and that includes opaque, transparent, and translucent liquids. The CM-5 Spectrophotometer has the ability to take measurements for the chemical and pharmaceutical industries according to several standard indices: Gardner, Hazen/APHA, Iodine Color Number, US Pharmacopeia, and European Pharmacopoeia. The CM-5 can store and later recall settings for multiple-user situations,using USB memory sticks, or store data on USB memory sticks for computer analysis later. 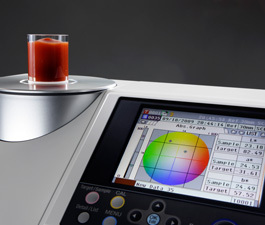 If a user need a more advanced analysis of data, the CM-5 Spectrophotometer can be connected to a PC with color software. * Security-enabled USB memory sticks cannot be used.